Wow, what a week it has been! I'm officially moved into the new apartment with ALG! I still have some lingering projects and some things to move in, but it's definitely starting to feel like home! Today I thought I'd share some scenes from the apartment with you and also let you know my next plans for making the place my own! We'll start with my room! I love the neutral palette with pops of color! The previous photo in this frame was of The Cuties--Bryce was a bit offended saying "I'm not even going to make the nightstand?!?" I explained to him that I planned to update my picture frames and think this one turned out to be the perfect match! I styled the bottom of the nightstand with some favorite books and my favorite House Beautiful EVER-- "The Power of Pink." On the other side of the bed I found a home for one of my TJ Maxx bamboo chairs (see post here). I would be doing a disservice if I didn't mention the curtains to y'all in this post. Would ya believe it if I told you my curtains were actually two shower curtains folded in half and hung by jeweled shower hooks? Would you believe it if I told you the entire window treatments (curtains, rod, and hooks) all cost $57! I've had a vision for my room but I've had to get creative to make it all happen! On the wall across from my bed is my dresser and closet. On my dresser I have pictures of some very special people in my life-- The Cuties, my parents, AMF, and of course, Bryce! I also found a special spot for my oh so special "The South" sign! We put these Anthropologie hooks on my closet to display some of my baubles. My elephant garden stool even found a home nestled between the dresser and closet! Now I'll give you some peeks into the rest of the apartment. ALG has already been living here for a year, so luckily for me everything was furnished with the exception of my room. This week, I've been able to add some of my own touches throughout the different rooms to really make it feel like it belongs to both of us. One of my favorite rooms is our sun room! In the living room I've added my personal touches to the bookshelf and coffee table! On the bookshelf I added some of my own picture frames as well as some prized trinkets: Lilly animal crackers, A Passion for Blue & White, and my stationery box. ALG also let me put my Haymarket Designs Tray on our coffee table! In the dining room I got to add my own personal touch to the bar cart! I was able to add my wine bucket, cocktail napkins (another TJ Maxx find mentioned here), cruiser wineglasses, cocktail stirrers, and Smarties! There is definitely no shortage of monograms in the apartment or on this bar cart. Between the two of us, there is a monogrammed wine bucket, monogrammed engraved julep cups, a monogrammed flask, and monogrammed wine glasses all on the top shelf of this cart! I have always loved the look of an upholstered headboard and have decided to make my very own with a matching bed skirt for my room. 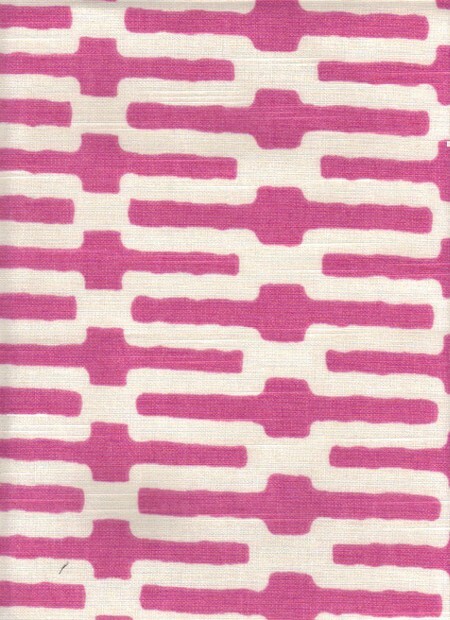 I haven't yet gone fabric shopping, but do you think something a little funky like this would be too much for the space? I want to go out of my comfort zone a little by mixing prints and colors, but it's scary! What the heck should I do with this boring wall? It's to the right of the door as you come in on the same side of the room as my bamboo chair. My dad has said we could add shelves to the walls, which I think could be good, but it's such a big wall, I'm worried a few dinky shelves would look awkward? What about a big mirror? Any suggestions or ideas are much appreciated, I need HELP! On the other big blank wall in the room (the far wall you first see when entering) I have decided to add a gallery wall. I have completed the layout of it and am hoping to have it up on the wall this very afternoon! So what do you think? Any suggestions for my big blank wall? How did you decorate your first place? Your new place looks great! I am starting to decorate mine, and I appreciate you posting yours. I got some great ideas! I love the new place, it looks absolutely amazing! So cute! I love the colors you chose for your room, I love every little detail. Also spying your latest book reads, your like me, I have them stacked all over the house! Your place is looking great! The pink issue was my favorite House Beautiful ever as well- I still flip back through mine from time to time! Did those $1 blue and white beauties come from Home Goods? Need! I absolutely love how you've decorated! It looks fantastic, Allie! And I'm jealous of all the progress that you've made... We've been living in our new place longer, and it definitely doesn't look that good! So cute! I love those Anthro hooks! wow it looks great!! and you even have a sunroom?!?! jealous! I love your room And new apt!! I bet you are just fhrilled to be there. congratulations! Oh my goodness your new place is adorbs friend! Love all of yall's monogrammed goodies! Those blue and white spheres are from home goods too? I may have to go pick some of them up today at lunch! Yay!!! Everything looks so great! I like the idea of shelves - maybe you could do BIG shelves...like, really long ones. They have them at Ikea, and I actually have one over my bed with SUPER large framed photos propped. It's slim, but takes up a lot of wall - makes a big statement. Everything looks great! I just pinned those Anthro hooks.. I love your idea to hang necklaces on them! Have a great weekend! your new space looks amazing! I'm glad everything is working out and I can't wait to see the future projects. Allie, it looks fabulous I'm so impressed with your decorating. I wish I had it in me in my 20s. Your place looks great! You definitely have a knack for decorating. So fun! I'm definitely stealing the Anthropology hooks idea- so great! So cute!! I especially love all of the monograms everywhere! I am jealous of your elephant stool/side table. I have wanted one of those for so long! Great job! Everything looks great!!! LOVE everything! Especially the initial hooks. Congratulations on getting moved in! I love all the monograms. A mirror would look great on the blank wall or a wall mural. Holy Cow I LOVE LOVE LOVE your room!!! Oh my gosh.... I just saved about half of these apartment pictures to my desktop under "inspiration folder" because I am in LOVE!!! You decorated so well. Love it all. And the shower curtains....best idea! Now, you can come decorate my place anytime! I am OBSESSED with those porceline balls! I was so tempted to order some from Gumps recently but they were $65!! $1 is a steal! I love the whole apartment! !